It’s been a little bit since I’ve made a post, but I’ve been busy fighting for that mythical full-time job. Good news though, totally got one! If you remember, I interviewed Becky Jewell of Graphicly a while back. I was really intrigued by their work and I wanted to get involved with their company somehow. Flash forward a bit and now I’m working as one of their Panel Cutters, slicing up comic/book pages for the optimum viewing experience on digital devices. Yessssss! Also, less important, but it was my birthday two weeks ago. I’m now the venerable old age of 26, and the only thing that I really wanted was an El Gato video game capture doohickey. My lovely lady totally delivered. Now I can record my fighting game exploits in HD instead of balancing my phone on a DVD tower. Man that was annoying… I’ve already started recording some of my Injustice matches and I may go back to UMvC3, but hot dog is this thing fun to use. Here’s an example of what I’m up to and watch out for more fighting game stuff in the very near future! What’s going on everyone? 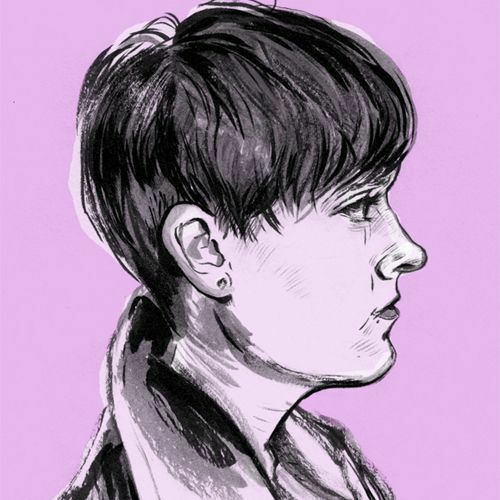 Some of you may recall that I’m working for this super cool comics journalism tablet magazine called Symbolia? Well we just started doing little interviews with the brilliant people behind the latest issue, Heroines. Check out the interviews right here! I tried to dig a little deeper into the motivations and feelings behind their work, and then include at least one silly question, sort of a “and now for something completely different” moment. I like the way they’ve turned out and I’m happy to share these bad boys with you. We’ll be doing one a day, so be sure to check out Symboliamag.com often for more! This week my favorite issue was Uncanny X-Force #34. I had been reading the book on Marvel Unlimited and it was awesome to see everything come to a head. Get out there, read my Unlimited Highlights, and let me know which of the Horsemen is your favorite! TMNT Micro-Series: Old Hob Review! I’ve got another review up over at DestroyTheCyborg! 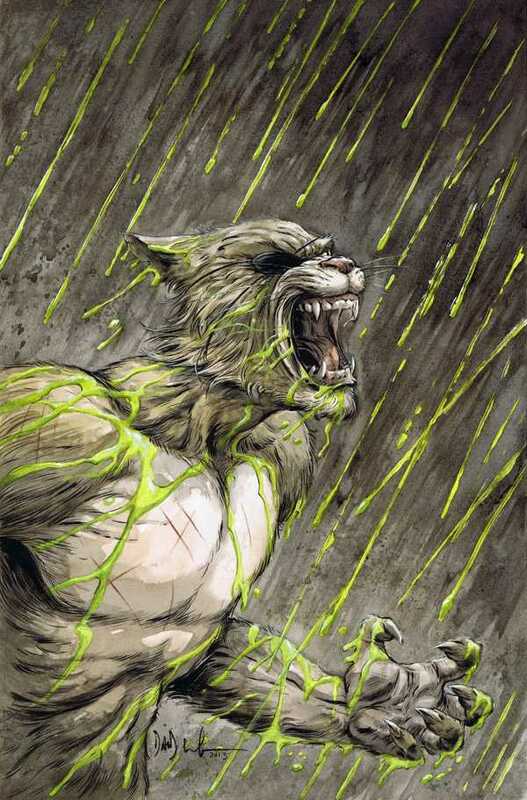 This time I’m talking about the monstrous and mangy cat man, Old Hob! We get a taste of his origins and his motivations and a little bit more on the side. Jason Ciaramella and David Wachter knock this one out of the park, adding a much needed something to the turtles’ previously uninspiring feline foe. I think Carnage looks good in the red, white, and blue. Don’t you? This week is all about Cletus Kasady in Unlimited Highlights, and if you don’t know much about the fiend, this is a great place to get stated. I personally haven’t read a ton of Spider-Man/Symbiote stuff in a long while but all of these books brought a little something different to the table, expanding on the tragic and horrifying legacy of the crimson killer. My personal favorite was Carnage’s first appearance in Amazing Spider-Man #361. The way that Peter slowly uncovers more and more of Kasady’s atrocities, starting with his childhood? Man that was creepy. Well what are you waiting for? GET READING! 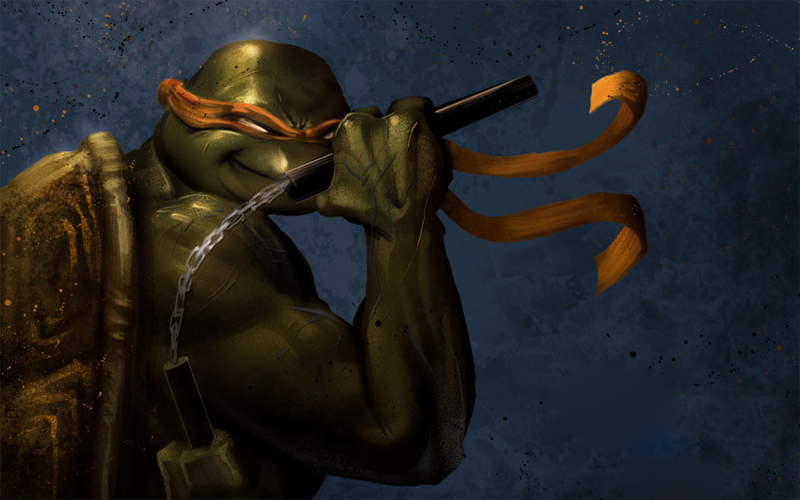 Today we’re shining the strobe lights on the Turtles’ premier party dude, the magnificent Michelangelo. He’s the youngest of the four, and undoubtedly the most spry. He flips, spins, and dodges Foot Ninjas with the greatest of ease, as his nunchuks e thwack and clunk off the unfortunate skulls of his enemies. He’s got speed sure, but what else does the orange-banded terapin have to offer the TMNT faithful? Let’s check it out! Despite the heavy editing in the trailer, and the slowdown to show off Mikey’s awesome animations, you can still see how quick he moves. He’s a flurry of nunchuk-spinning pain. 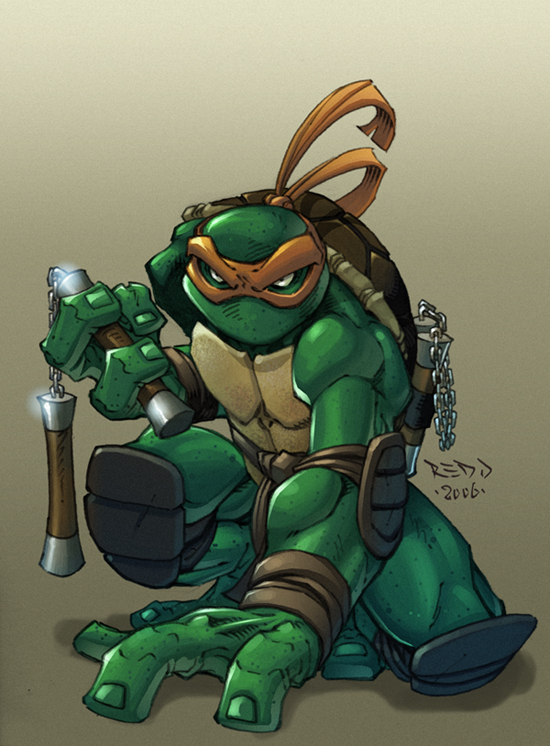 Again we get a taste of the turtles’ defensive capabilities, as Mikey counters not one, but two Foot ninja attackers at once (:15)! This might indicate that Red Fly has taken a page out of the Batman book and allowed for multiple parries at once. Cowa-freaking-bunga. Is it as easy as just pushing a button? For supposedly being the turtle with the worst single enemy damage output, Michelangelo has more than a few ways to deal with crowds. Check out one beefy spin cycle at :44 and a shell sliding spin attack at :46. Mikey spins around with nunchuks out, laying low anyone in his way. Does it look like the handstand version clashes with a Foot attack? Are we seeing a little invincibility there, or did Mikey just knock him out of his animation? Then we have the nut cracker, the oh so beautiful nut cracker (:36). I think it might be the highlight of this little vignette and I love it. Mikey also has a flash kick (:22), though he does it without the help of a bo staff. I’m not quite sure how the special moves work in this game, IGN seemed to think that they were mapped to the right stick, thus I don’t know if this is a special move or possibly a combo ender. Or maybe a command normal? Then we’ve got the attack at :41, which I’m going to be calling the Turtle Tower, just for giggles. Mikey breaks one ninja’s guard with a powerful rising uppercut, then sweeps the leg for a knockdown while his opponent is reeling. Might be useful for those turtling enemies. Heh. In Raphael’s vignette we saw him leap off of a truck and embark on a beatdown of epic proportions. Mikey shows off some acrobatic flair of his own, swinging around a sign post wailing on dudes (:25). So now we know that the turtles are more than capable of using the environment to their advantage. I wonder what else they’ll be able to play with? There was a lot less for me to talk about in the Mikey video, I think mostly because we talked about a lot of it in the previous posts. He’s fast, agile, and brings a whirlwind of pain to the creeps dumb enough to get in his way. He also brings the party. Cowabunga. Symbolia Half-Off Sale This Weekend Only! If you guys haven’t heard, Symbolia is having a subscription sale during the Chicago Alternative Comics Expo! You better jump on this deal though, because it ends Sunday night. 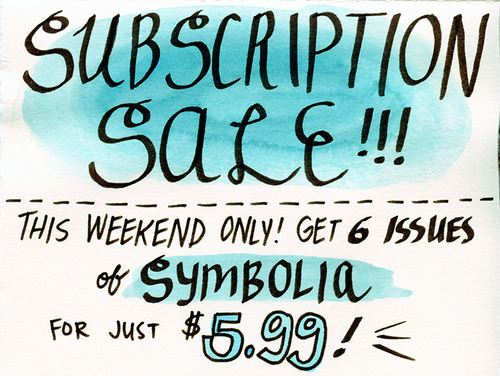 Normally a Symbolia subscription is $11.99 for six issues. Now you can get 6 issues of impeccable comics journalism for $5.99 – $0.99 an issue! Hurry up team, Sunday will be here before you know it! Get it now: on iPador via PDF. Follow Symbolia on Twitter, like us on Facebook, and be sure to pick up issues or subscribe to the magazine here!